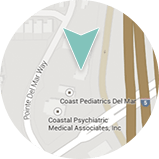 Enlarged pores, clogged pores, and uneven skin texture are common complaints at our Del Mar dermatology practice. Depending on how large the patient’s pores are and the condition of the skin, treatment may be as simple as using a nightly retinol product and seeing our medical esthetician for pore cleansing extraction facials. 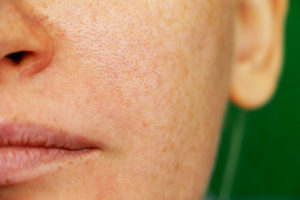 For other patients these steps may help to reduce the pore size, but it may not be enough to give the result they desire. This is when we may suggest an in-office treatment plan with laser treatments and /or ultrasound. 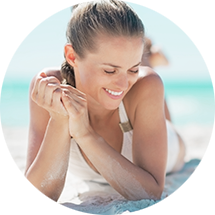 Fraxel® Dual, a laser skin resurfacing treatment, is great for improving your overall skin texture. It can firm the skin, shrink pores, and even erase fine lines and wrinkles. One other advantage to the Fraxel Dual is a marked reduction in actinic (pre-cancerous) damage. Fraxel Dual is FDA approved to treat pre-skin cancers, improving your skin’s overall health. For patients who suffer with active acne and/or acne scars, Smoothbeam™ laser is an effective treatment with a long safety record. Smoothbeam was originally used as a collagen-stimulating laser to treat fine lines and wrinkles. It was soon discovered to have acne-fighting benefits and became the first laser FDA approved laser to treat acne and acne scarring. For enlarged pores and rough texture, Smoothbeam can soften and smooth the skin after a series of treatments. It will also reduce oil production in patients with oily or acne-prone skin. Less oil reduces clogging in the pores, thus reducing comedones (blackheads) and pustules. Ultherapy® is a focused ultrasound device that uses sound waves to strengthen connective tissue and stimulate new collagen to form. This causes lifting and tightening, and a general smoothening of the skin. Ultherapy Pore Refine is a newer treatment that is receiving rave reviews from our patients. For those patients with enlarged pores or rougher texture. Ultherapy can shrink pores, smooth the skin texture, and give a more matte finish to your skin. Ultherapy Pore Refine is generally performed in a series of two treatments 4-8 weeks apart. For individuals with more significant texture changes, additional treatment may be recommended. This skin-smoothing treatment is quick, comfortable, and there is NO DOWNTIME! For optimal results, along with your in-office treatment, we recommend a topical skin care regimen that includes a physician-strength Retinol Complex, a physical block sunscreen, and pore purging treatments (purifying facials) with our medical esthetician.